The First Step to contributing to the creation of an enlightened planetary civilization® is to get your own life in order. You help others by helping yourself, and that gets the ball rolling. How do you help yourself? By becoming better acquainted with the inner workings of your mind and the mental hologram that you regard as self. 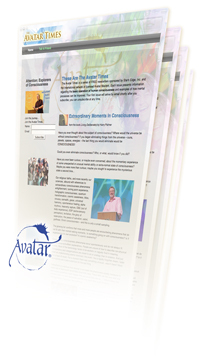 The Avatar® Times is more than a FREE e-newsletter; it is a new perspective. Start your Free subscription to the The Avatar Times. Your first issue will arrive by email shortly after you subscribe; you can unsubscribe at any time.